A day to remember BC police officers lost in the line-of-duty. 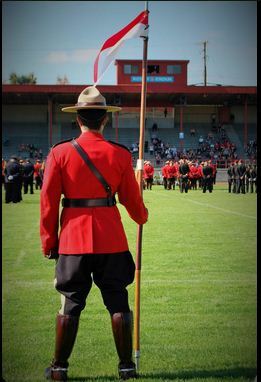 The sun shone again, for the 16th time in the 17 year history of the BC Law Enforcement memorial, commemorating those officers of the RCMP and all other police forces who lost their lives in the line of duty in British Columbia. This is an annual event that draws police members from all over British Columbia and Washington. A similar memorial is held in each province at the end of September, with a national memorial held in Ottawa. This is also an opportunity for the three police pipe bands in the Lower Mainland to play for the honour guards and troops who march to remember their past colleagues. The RCMP E. Division Pipe Band, under Pipe Major Hugh Peden and Drum Major Rob Smith, led the bands to Rotary Stadium in Abbotsford today, followed by the Delta Police Pipe Band, under PM John Ralston and Drum Major J.P. DaSilva and the Vancouver Police Pipe Band, under PM Cal Davis.